In May 2018, a mother and toddler were tragically hit and killed by a speeding motorist along Tampa’s scenic Bayshore Boulevard. This senseless and unspeakable loss of life inspired cries for a more pedestrian-friendly roadway. These concerns were recently heard at a city council meeting where Bayshore Boulevard was discussed. The popular roadway, favored by pedestrians, cyclists and motorists alike, has been under the microscope after the terrible incident on May 23rd. While it seems like changes can’t come soon enough, fortunately, the city has elected to make multiple changes in a 3 phase project, with efforts aimed at making this busy boulevard a safer place for the community. Bayshore Boulevard is a scenic stretch of roadway that runs along Hillsborough Bay in Tampa, Florida. It’s a popular choice for commuters and pedestrians because of its proximity to the water and its long – and mostly straight – stretches of road. The speed limit was recently lowered from 40 miles per hour to 35 in an effort to reduce dangerous speeding. In addition to the speed reduction, the city has also replaced the signage with new, more visible markers in addition to painting the new speed limits onto the roadway itself. This certainly isn’t enough to deter people from racing along the roadway, which was the cause of the accident that took place in May. A mother was pushing her 2-year-old daughter along in a stroller when the incident happened. Three people were arrested after the collision, being charged with street racing, reaching speeds of 102 miles per hour. In an effort to reduce these kinds of reckless driving events, the city is also going to be narrowing the lanes, creating a wider, more buffered bike path. As the roadway narrows and the bike path is widened, traffic should naturally slow. At least that is the intended result. Both lowering the speed limits and narrowing the roadways should improve the safety of cyclists and pedestrians that continue to take in the beautiful scenery offered by the boulevards alternative travel methods. Expected to be finished in October, the city is also installing several lighted, pedestrian-activated crosswalks, something many community members feel has been sorely missing and long overdue. Adding several more crosswalks is still under consideration as these improvements continue their development. Conspicuity plaques, or signs that inform motorists of road rules, are also being placed along the roadway to promote safety awareness. 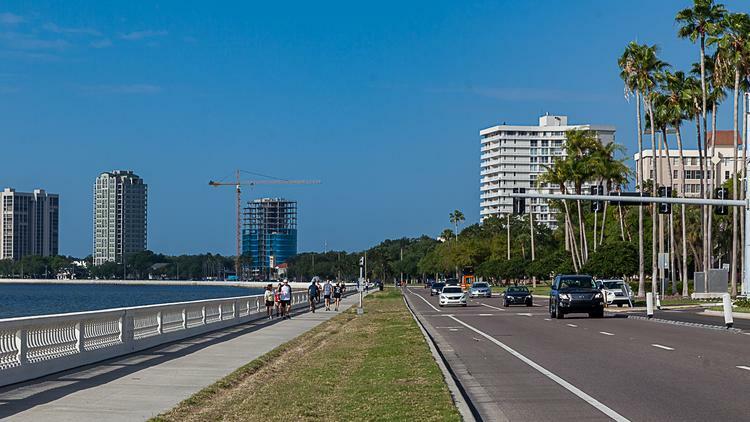 The city is also working to fix the sidewalk gaps that exist on the west side of Bayshore Boulevard, increasing the pedestrian safety along the walkway. As part of the 3 phase implementation of this project, the city is planning to add more bike lanes south to Gandy Boulevard, providing cyclists more commuting options. Bayshore Boulevard is hardly the only dangerous roadway in Tampa, as many citizens pointed out at the recent city council meeting. Bay to Bay Boulevard is yet another dangerous and crowded route. In any case, the city is taking action and considering more alternatives as a way to make the city safer for pedestrians, cyclists and motorists alike. As Tampa continues to grow, the safety of the people that inhabit the city becomes ever more crucial, especially on the roadways which are increasingly dangerous. What’s clear is that it shouldn’t take a tragic loss of life for the city to take action. Bayshore Boulevard has long been dangerous to those that travel on it. It remains to be seen if these new changes will reduce accidents, but it’s a start for a roadway that has long needed more safety improvements.